mwe3: Tell us about Firm Fragile Fun and what were your musical goals this time? Where and when was the album written and recorded? 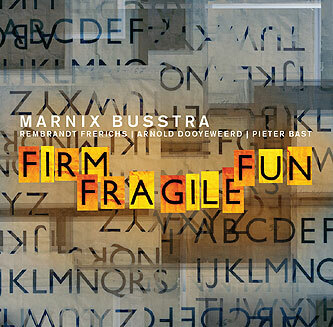 Marnix Busstra: Firm, Fragile, Fun is the second album of the Marnix Busstra Band, with the same musicians as on our debut album Sync Dreams - Rembrandt Frerichs  piano, Arnold Dooyeweerd  bass and Pieter Bast  drums. After the release of that album we played a lot of concerts with the band, and I came to realize that these musicians are not just jazz-musicians  they are capable of playing a lot of different styles, without losing their unique personalities. So with Firm, Fragile, Fun I wanted the repertoire to be as varied as possible, to use all the possibilities of these fine musicians. I wrote the music for this album in the first half of 2014, we recorded in October/November 2014, in Sandlane Studio in Rijen in The Netherlands. Its a great studio for this kind of recordings, with very good natural acoustics, especially for the drum sound. mwe3: You actually have another recently released album as well called Best Of Both Worlds? Tell us about that album and some of the things your did with other Dutch artists on the album. Marnix Busstra: This year  on the 30th of August 2015, I had my 50th birthday. 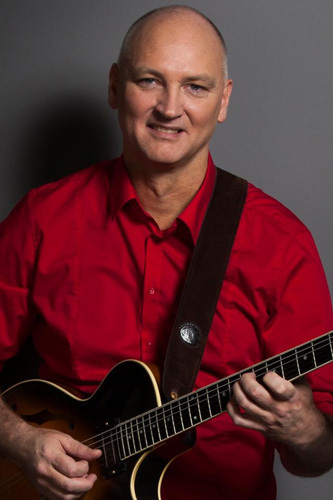 The album Best Of Both Worlds was released on that date, with an overview of my work as a guitarist and composer from the last 20 years (1995-2015). Its a double-album, with the first CD featuring instrumental jazz of the different bands I played in and wrote music for. The second CD is filled with vocal music I wrote, mainly for my wife Karin Bloemen, who is a very well-known singer in The Netherlands  we work a lot together. Theres also one song, Tale Of Two Angels, with singer Dianne Reeves, which Im very proud of; its definitely a good composition and she sings it absolutely beautifully! This album is only released in The Netherlands, because most of the vocal compositions are in the Dutch language. mwe3: Some of the tracks on Firm Fragile Fun are very jazzy and then some have neoclassical and even progressive rock ideas in the mix. Is that how you would describe the sound of Firm Fragile Fun? Progressive bop jazz? Marnix Busstra: To be honest, I dont really care what anyone wants to call it. 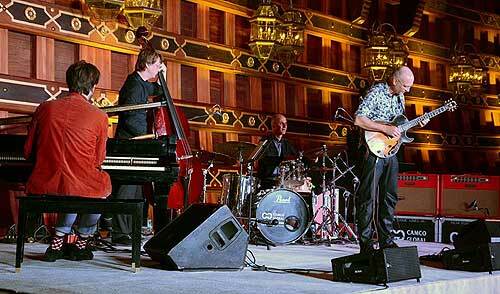 I believe the main identity of music is made by the musicians who are playing it. But you could call it free rock, moody bop jazz with a hint of ethnic flavors, or funky neoclassical world jazz or whatever. I think jazz always absorbed all kind of influences, and nowadays a good jazz musician can deal with and improvise in all kind of styles, without losing his own identity. That gives a lot of freedom and possibilities! mwe3: The cover art and CD booklet has some interesting twists of word play on the Firm Fragile Fun title like Moody Fragile Gone? What does the title signify and how does it apply to the album cover art as it appears? Marnix Busstra: Im very happy with the artwork of this album. I worked for years now with the same designer, Rob Becker, but this is one of his finest work! The idea of the one word titles came up because the different tracks all have a very strong identity, in composition and in the way the band plays it. For example the first one, Stress, is indeed a very stressful song, and the second one, Fun, indeed has got a very funny mood in it. So I chose to underline this by giving the songs these one word titles. I chose Firm, Fragile, Fun to be the album title, because these three words captures pretty much the all around mood of the album. And what I like about the cover art is that you see in the background all other characters floating around. Overall, it gives the impression as if the chosen words are floating on a sea of words, as if these chosen moods are indeed part of life itself. mwe3: Whats the reaction like to Firm Fragile Fun album in Holland and in the neighboring countries? Firm Fragile Fun has a kind of Euro-centric sound to it even though you have said it has that American jazz effect too. Its a unique jazz mixture with the Dutch vibe, and I might add a Ackerman-esque guitar sound? 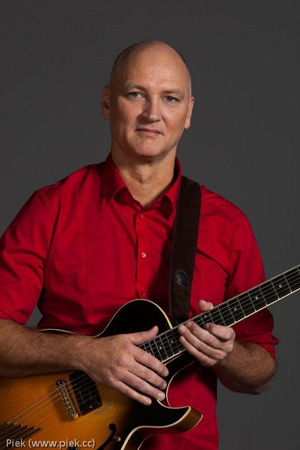 Marnix Busstra: Nice to bring up Jan Akkerman, a great Dutch guitarist musician of course! His sound was definitely an inspiration for me when I was young, so maybe you can still hear echoes of that influence in my sound and music. mwe3: What is your working relationship like with Norbert Sollewijn Gelpke and how did it influence the sound of Firm Fragile Fun? Compare the new album and working with Norbert on the Sync Dreams CD from 2013. Is there a secret to getting a great studio sound? he knows exactly what Im looking for in music. He is a great electric bass player. We just started a new band, The Old School Band and we will record in January. And hes a fantastic engineer too. He has his own mixing-studio, with all kinds of great analog equipment. He is a master of capturing the music in a great, warm, analog sound, so he is definitely very important in the whole process. you can hear that for sure! The sound of Sync dreams is a little different from Firm, fragile, fun, I agree. Main difference is that we used analog tape as a mastering-tool for Sync dreams - we didnt do that this time, because we liked the sound already without using that final step. mwe3: Have there been any recent developments in your gear and guitars? Did you use the Howard Roberts jazz guitar solely on Firm Fragile Fun and were any other guitars used? What else can you tell us about that custom electric sitar you play from the builder Gunter Eyb? Is that the electric sitar on Deep? What a cool track, of spacey bop jazz played on sitar! When did you get the idea to use the electric sitar? You dont hear that sound a lot on jazz albums these days. Marnix Busstra: Yes, I used the Howard Roberts for almost all the tracks. I used an Irish bouzouki in Joy and indeed the Günter Eyb electric sitar in Deep. I played the melody in octaves, and thats what gives it the special, spacey atmosphere. But on all the other tracks I used the Howard Roberts. I just love that guitar! But I dont have any important developments in my gear these last years. I still use the same guitars, amps and pedals. Im just happy with it. mwe3: Are you still using the same guitar effects from Sync Dreams on the new album or and what effects and amps did you record the Firm Fragile Fun album with and what amps and other essentials do you use in live shows? 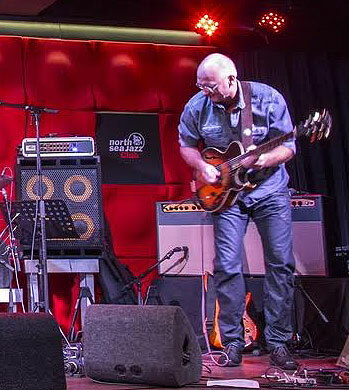 Marnix Busstra: I indeed use the same effects: Ibanez Hand Wired Tube Screamer, a T-Rex Replica delay, a TC-electronic chorus, to make it stereo and two T-Rex Room Mate reverbs. And the amps I use are two Bogner Duende 112. If possible, I use the Bogner Duendes live also, but when its not possible to bring them I just use whats on stage. But the combination of my guitar and effects is enough to keep my own personal sound, even with other amps. mwe3: Are you still defining your guitar and compositional sound? How do you improve as a guitarist and a composer? How about practicing and staying in shape as a player? sometimes thats necessary but I very much like it when the process is as natural as possible. So for me the main thing is that you listen to yourself and feel where the inspiration is on that particular moment in time. Sometimes its studying, sometimes its composing, sometimes its watching TV and doing nothing at all. Those periods can be frightening, because you might think; Its over for me, I cant do it anymore! But until now, those periods always appeared to be just necessary to restart the engine. mwe3: The internet hasnt really been exploited very well by the artists so far or has it? Are there live concerts on line yet? Have you done any live broadcasts over the internet via cams or something? What do you make of the internet? Is the internet still too fascinating to make some serious statement with it? Marnix Busstra: Indeed, the internet is not my best friend. To be honest, I kind of hate Facebook and those kind of platforms, its just not my cup of tea. But we did a multi-camera recording of a live show recently, it will be online in a few months. And on my website you can find some live-recordings as well. mwe3: What are your live shows like? Whats the chemistry like with your band? Do you like doing live shows or recording and producing music in the studio more? 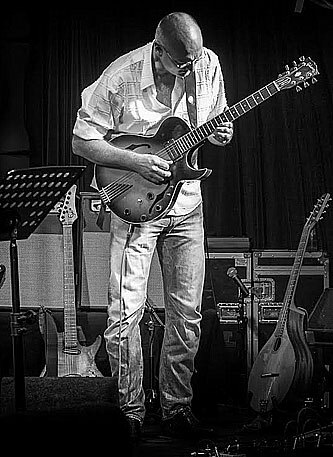 Marnix Busstra: Playing live and recording/producing in the studio are two totally different things, but I both like them equally! 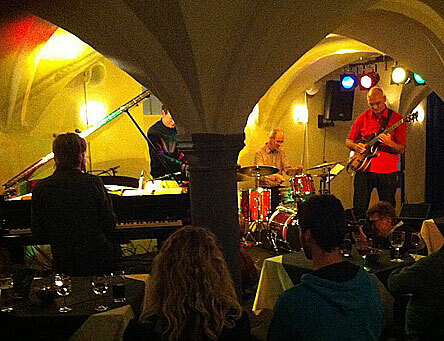 On the other hand, I do think jazz, more than non-improvised music, is meant to be live. So when I make a jazz-record, I like it to be as live as possible, with a lot of freedom for the players to interact and be spontaneous in their playing. mwe3: What else is new in Holland musically? How about socially? How do you compare Holland with the rest of Europe socially or in the EU scheme of things? Marnix Busstra: In Holland there are a lot of young jazz musicians, because we have a lot of conservatories here, much more then for example in Germany. So there are, besides loads of Dutch kids, also a lot of foreign students in Holland all trying to find their way. So the situation is not easy for them when they graduate. A lot of them, also Dutch players, leave the country after their music studies. I dont think there is a very specific Dutch way of playing jazz or a Dutch musical identity. For example a country like Norway does have that identity, and they use that as an export product. So its easier for a new Norwegian band to be invited abroad, because of that positive identity of their music, which is great of course. In the past, the identity of Dutch jazz was mainly based on musicians like Misha Mengelberg and Willem Breuker, who played a kind of theatrical free jazz. But that way of playing is not very common anymore here. mwe3: Have you come much closer towards your dream of playing a concert in the US and even Canada? Your sound is too good to not come to North America! But the U.S. including Canada too is such a huge country, so youd probably just want to play a few choice places! Whats your dream show to put on here? Where would you like to play? But I dont have a specific dream of playing the Blue Note in NY or something like that. Just to play somewhere and reach people with my music, thats the only dream I have. mwe3: What are you looking forward to musically? Is it too soon to think about new music composing and even another album in the works?